Open source telephony systems are making big waves in the communications industry. Moving your organization from a lab environment to production system can seem like a daunting and inherently risky proposition. 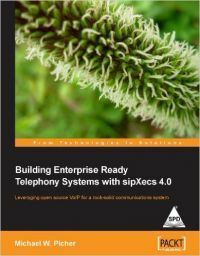 Building Enterprise Ready Telephony Systems with sipXecs delivers proven techniques for deploying reliable and robust communications systems. Planning a communications system for any size of network can seem an overwhelmingly complicated task. Deploying a robust and reliable communications system may seem even harder. This book will start by helping you understand the nuts and bolts of a Voice over IP Telephony system. The base knowledge gained is then built upon with system design and product selection. Soon you will be able to implement, utilize and maintain a communications system with sipXecs. Many screen-shots and diagrams help to illustrate and make simple what can otherwise be a complex undertaking. It's easy to build an enterprise ready telephony system when you follow this helpful, straightforward guide. What you will learn from this book Understand the complexities of an IP Telephony and Voice over IP network Build a clear process for migrating existing phone systems to an IP based system Deliver a solid foundation for any IP based phone system Quickly and easily get a sipXecs open source PBX running Utilize Internet Telephony Service Providers to reduce monthly telephony bills Leverage sipXecs Automatic Call Distribution Queues to handle basic Call Centre needs Operate and Maintain a reliable communications platform Approach This book was written to be a step by step approach to building a communications system for any organization. Care was taken to clearly illustrate with diagrams and screen shots all of the steps and concepts along the way. Who this book is written for This book is written for network engineers who have been asked to deploy and maintain communications systems for their organizations.